Campgrounds-Alaska: Listings to Alaska campgrounds and Alaska RV parks. 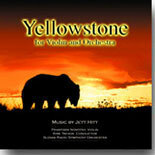 Be sure to check out the number one selling CD in Yellowstone by your guide, Jett Hitt. It is a full scale violin concerto recorded by the Slovak Radio Symphony.